Why did a Chaplain also become a Diamond Broker? After a stint in an import business representing a few select African, European and Israeli companies, John founded Covenant Stones, Inc. in 1994; it was initially located in his father’s (Carl D Dawson Sr.) law office complex on Adams Street in downtown Jacksonville. The company name was chosen as a diamond is often a tangible symbol of a “covenant of marriage” ~ John’s specialty is diamond engagement rings and he tries to use his pastoral skills to insure that the couple is actually ready to get married before he will offer to sell a ring to them. 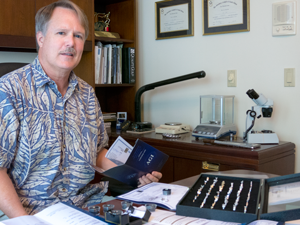 This small business simply brokers diamonds and jewelry as requested by clients on an appointment only basis. The scenario works well as John’s day is otherwise filled with ministering as a Chaplain to elderly people on a regular basis as well as others at any age as needed. 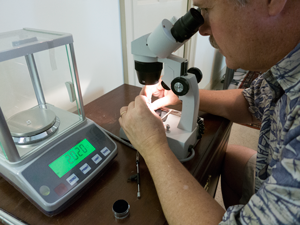 Covenant Stones, Inc. does not have the overhead that jewelry stores are burdened with so our pricing is extremely competitive. In these 30+ years, we have never been accused of misrepresenting or overcharging a client! We strive to insure that everyone is pleased with their purchase and rely on their positive experience. We do not advertise or deal with the general public because we have chosen to only work with referrals from past clients, their families or friends. Interested in purchasing jewelry through Covenant Stones Inc? Send us an inquiry through the form below. Name: Email Address: What type of jewelry are you interested in?